Techstream TIS VCI Installation Guide (64-bit OS) Including All Software Needed! This is for anyone that is currently trying to use Techstream software to change dealer settings on their BRZ/FRS with a MINI-VCI cable and software. I know there are a few threads out there already on the subject, but they don't contain any useful guides on how to actually succeed in activating and using this software, it's mostly just download links. I got stuck doing Google searches for about 2 hours trying to figure out if this could be done on a Windows 64-bit computer without the use of annoying Dual Boot or Virtual Machines on XP, and despite what most of these threads say, IT CAN BE DONE! The software works on any OS, but the drivers are the problem so instead they just have to be downloaded manually. I hope this helps some of you guys out. The cable comes with a mini CD with drivers and Toyota Techstream software. Mine was advertised as “Newest V8.00.034 MINI VCI for TOYOTA TIS Techstream Diagnostic Cable & Software”. The “newest” refers to the version of bundled Techstream, rather than the cable firmware, as cable shows serial number “MVCI006000001” and firmware version 1.4.1, which is widely known as “cheap clone of the original XHorse MVCI cable”. A laptop running 64-bit version of Windows 7/8. Mine is actually Windows 7 x64, but for Windows 8 the configuration procedure should be identical. The Techstream, MVCI drivers and TIS Key all can be found on the mini disk, but I will leave a .zip download containing them if you guys need them. Download and install a trial version of WinRAR if you don't already have it. Using WinRAR Unpack the following files from either the mini-CD or the download to a temp folder on your hard drive (Use c:\temp). Now open WinRAR again. Using the program, navigate to the temp folder with unpacked files and double click the TISKey.exe in WinRAR. 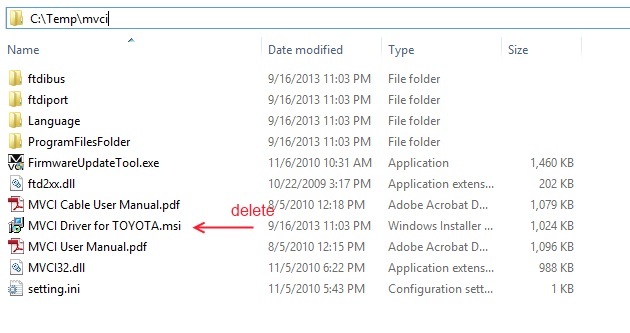 The TISKey.exe is actually a self-extracting (SFX) RAR archive file. Once executed, it simply unpacks and copies the IT3System.ini file to the Techstream folder. Extract the IT3System.ini file to desktop for now. Delete the “MVCI Driver for TOYOTA.msi” there. (Now go into C:\Program Files (x86) and then create a new folder called "XHorse Electronics" and then inside of that folder create another called "MVCI Driver for TOYOTA TIS") Then copy the whole content of c:\temp\mvci to "C:\Program Files (x86)\XHorse Electronics\MVCI Driver for TOYOTA TIS"
Plug the MINI VCI cable to the USB port. Open the Device Manager and locate the two failing devices in the list. Both will appear with yellow icon (usually under “Other”), indicating that Windows failed to install drivers for them. Now, right click each failing device, select Install Driver, then “Browse my Computer…” and point it for "C:\Program Files (x86)\XHorse Electronics\MVCI Driver for TOYOTA TIS" (enable the “include subfolders” flag). Click “Next” and wait until drivers are installed. You should now see two new devices: “Universal Serial Bus Controllers\USB Serial Converter” and “Ports (COM & LPT)\USB Serial Port (COM5)”. If you see this, it means your MINI VCI is up and running under Windows x64 and can be used by other programs, such as Techstream. IMPORTANT: Some people have reported that updating firmware on this “cheap clone” cable may render it dead. 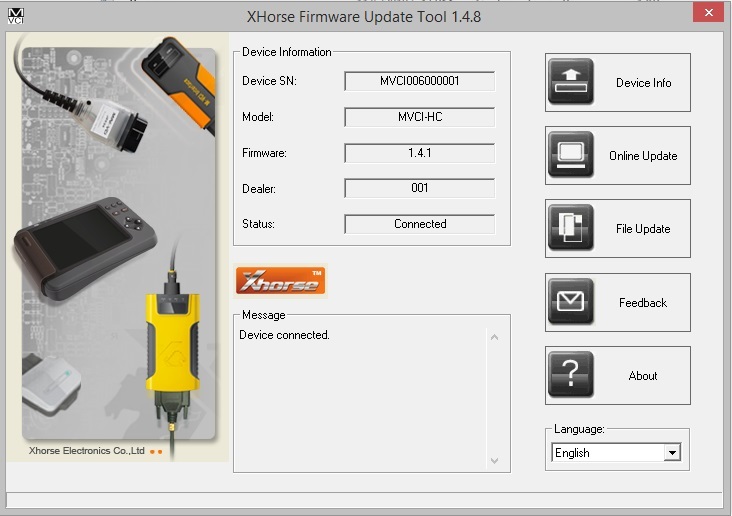 So, the Firmware Update Tool should NOT be used for anything, but checking that the device is connected and working properly. Now install the Techstream software using "Techstream 8.00.034.exe" and then after installation, open up the "Techstream_Update_V8.10.021.exe" file to update it. DO NOT launch it yet. To activate it, drag the IT3System.ini you extracted before to the desktop over into "C:\Program Files (x86)\Toyota Diagnostics\Techstream\Env\". When prompted, overwrite the preexisting file with the new one you are dragging over. "ConfigApplication"="C:\\Program Files (x86)\\XHorse Electronics\\MVCI Driver for TOYOTA TIS\\FirmwareUpdateTool.exe"
"FunctionLibrary"="C:\\Program Files (x86)\\XHorse Electronics\\MVCI Driver for TOYOTA TIS\\MVCI32.dll"
"ProtocolsSupported"="J1850VPW:1, J1850PWM:1, CAN:1, ISO9141:1, ISO14230:1, ISO15765:1"
A trick here is the "Wow6432Node" in key path, which is the location the 32-bit applications running on 64-bit OS get redirected to when accessing Registry. The "PassThruSupport.04.04" seems to be the place Techstream looks into for available VIMs (sub-keys appear in the "VIM Select" menu in Techstream). Connect MVCI cable to your car’s OBDII interface, turn ignition on, then click “Connect to Vehicle” in Techstream. Wait. Then wait again (by the way, you'll be doing that a lot with this cable ). If everything works, you will be prompted to confirm car year/model after which you'll get to the diagnostic interface. Just to clear it up, you do not have to register this software after this is all done, it is yours forever (almost). Mostly all of the customizable options can be accessed with this update so I would not mess with it and try to get anything new as it is not needed! I hope this guide works for you guys, it sure as hell saved me a whole lot of frustration when I found it. If you have any questions regarding installation just comment and let me know! Last edited by Jhood; 08-27-2014 at 09:15 PM. Thanks for putting this together, I am going to give it a shot. No problem, just added in a Dropbox link to all of the files needed. Sorry for the duplicate msg, but was not sure if first one went through because of being a new member to forum. Thanks for the great detailed write-up on the install. I followed it closely, and every thing really seemed to work just rite. however when I went to run the program I get an error msg. "unable to connect to VIM" I got the XHorse utility to recognize the VIM, and the program to start, but when connect to vehicle is selected the error msg pops up. I guess I suspect I did not do something correct with the registry hack??? Carista can do dome of the basics as well. I found these instructions necessary for installation of the latest version, 10.00.028, which I just purchased along with the Mini - MVCI cable. I went through every step and the one difference is that step 3 is no longer required. Can't thank you enough because all of the other advice I found on the web wasn't working. Thanks. Sorry guys, for everyone who had PM'd me I had the car garaged for the winter, I haven't worked on it or been on the forum in a while. I'm finally back though. I guess I suspect I did not do something correct with the registry hack??? Not sure if you already figured this out, but yes my guess would be if your computer recognized the cable, but does not work with the software, that you either need to go back over the registry editor step (you could always manually edit it as well) or the update to the software was not successful, make sure you're currently running v8.10.021. @davesrave seems to have it working on v10.00.028 as well. I have tried the steps above several times and still can't get to work. Any help greatly appreciated. I could only get the software/drivers to work on an old XP laptop I had. I tried, 2 windows 7, 1 Vista, 2 Windows 8 and had no luck. So you might want to try it on something old. I'm not sure how relevant this is but there is a seller on the Bay that says "For toyota and lexus before 2005, we recommend the Original Mini VCI Cable with latest v2.0.4 firmware (K-line Supported)" which they just happen to sell. I have a 2001 Land Cruiser and I had ordered the Newest V8.00.034 MINI VCI for TOYOTA TIS Techstream cable and I could get it to connect via your method and my Win 64 laptop (but not my Win 32 laptop oddly enough) but it would not see all of the systems. I could not see a Smart Key or when it ran the Health Data it could not connect to all of the Systems. I just kept searching and searching to find out why I could not and ran across this. So I have returned my other cable and have bought one that supports K-line instead. I hope it will detect a Smart Key this time. Thank you for your write up. Works great thanks. Followed this to a T on a Lenovo W530 operating Windows 7 64bit. I purchased my cable off of Ebay "White Mini VCI 16 Pin OBD2 Diagnostic Cable for TOYOTA TIS Techstream" from seller "nycom-tech"
The menu is a little counter-intuitive, but seem to be able to access all features. Also when I ran the firmware update tool, all the device information matched yours exactly.